Seagate suggests that the BarraCuda Pro Compute drives are suitable for use in direct-attached storage systems. 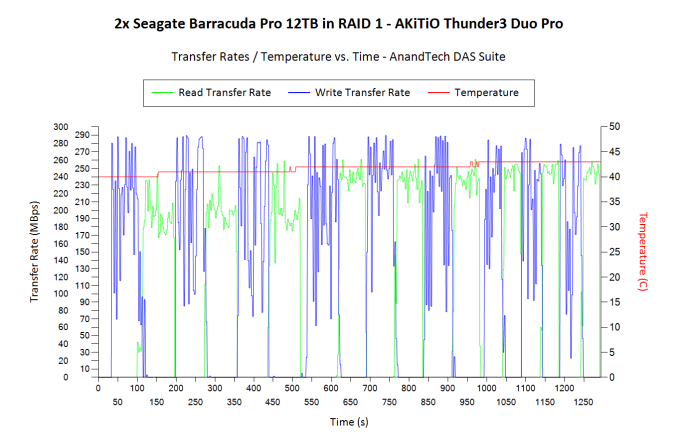 We evaluated the performance in such a usage scenario using one of the highest performing 2-bay DAS units currently in the market - the Akitio Thunder3 Duo Pro, connected to our testbed via a Thunderbolt 3 interface. 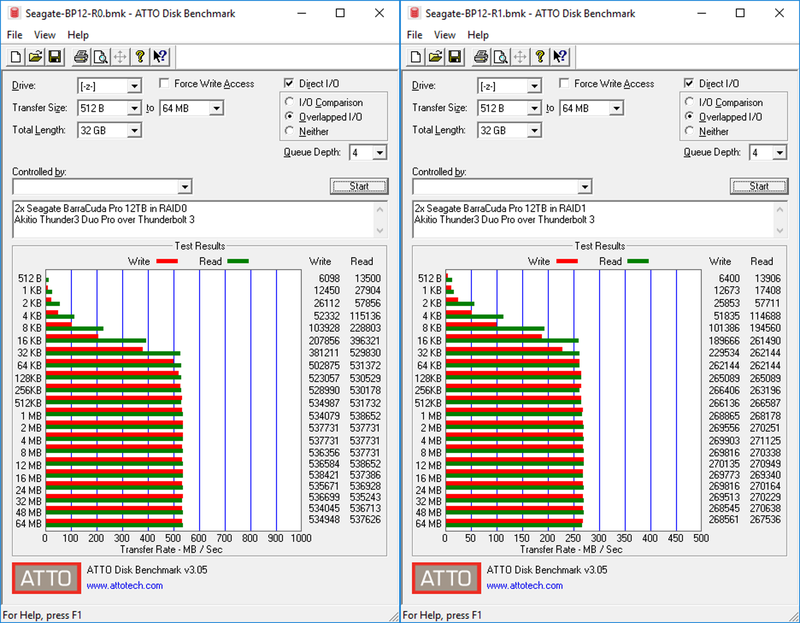 Prior to processing real-life workloads, we first checked quick artificial access traces using ATTO and CrystalDiskMark. We find that the performance remains consistent irrespective of workload size as long as the sequential access characteristic holds. Two drives in RAID 0 can sustain 530 MBps+ reads and writes. 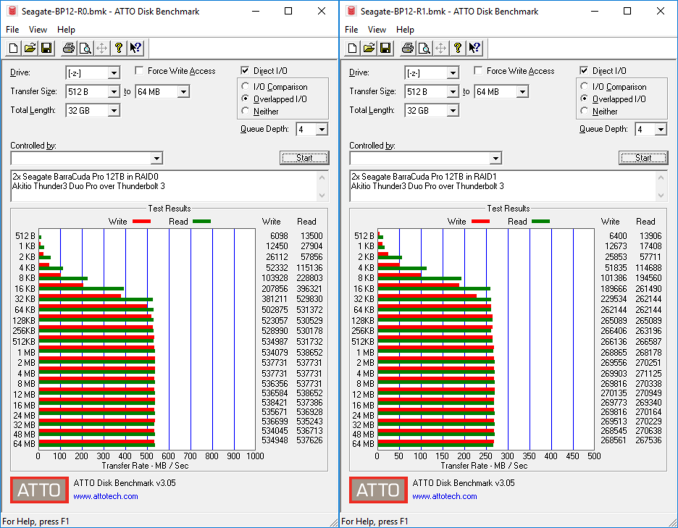 RAID 1 performance is similar to the standalone drive performance. Both RAID0 and RAID1 configurations were subject to our standard DAS test suite described in the previous section. The robocopy test suite gave the following results. There is no difference in the performance consistency between either RAID configuration. The behavior is largely similar to the internal drive scenario, except for the RAID 0 absolute bandwidth numbers. Thanks to the enclosure's fan, the temperature increase is also not as much as what we observed in the internal drive case. We also processed select workloads from PCMark 8's storage bench. 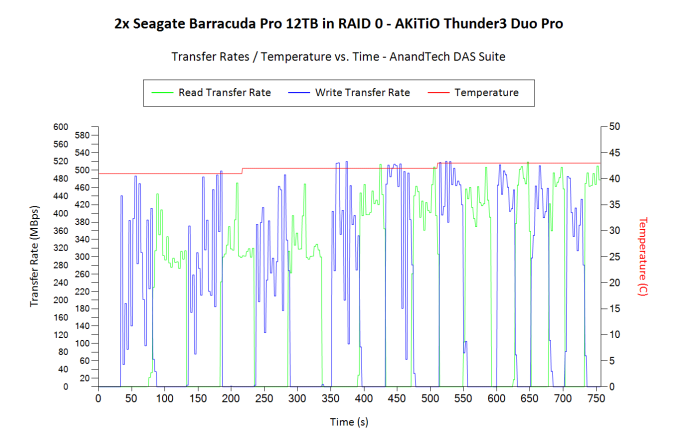 A significant speed-up in response time is achieved while dealing with multimedia files stored in a RAID 0 configuration of two BarraCuda Pro 12TB drives in a Thunderbolt 3 enclosure. 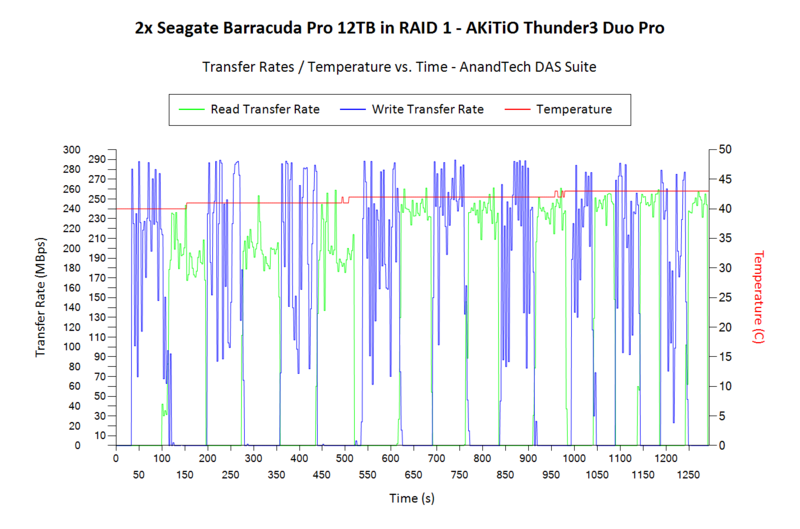 Combined with the consistency shown, we can say that our results back up Segate's claims regarding the firmware tuning of BarraCuda Pro drives for specific application scenarios.